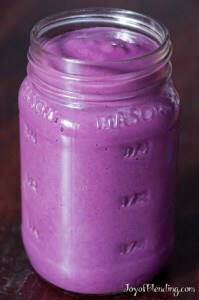 I came across some good looking purple sweet potatoes, so I couldn’t resist turning one of them into a purple smoothie. This is similar to the previous recipe I listed for a sweet potato smoothie, except this time I added cinnamon and substituted blueberries for cranberries. The combination of apple, sweet potato, ginger, and cinnamon flavors makes it reminiscent of a pie, and it’s hard to argue with the purple color. Blend on high until smooth and enjoy! Remember that you can always add a little more water or ice if it’s too thick. If it’s too thin for your tastes, add some chia seeds or add less water next time. On my previous sweet potato smoothie post, reader David suggested cooking sweet potatoes in the microwave, and this time I only had one sweet potato, so I gave it a try. I was concerned about the sweet potato cooking evenly, so midway through I turned it over. It worked perfectly well, although I think I will continue to use the traditional oven when I have multiple potatoes or if I have the oven already on for something else. The extra time it takes in the traditional oven is usually not a problem because I typically cook the potatoes the day before I use them so that they have time to cool. Cooked sweet potatoes store in the fridge for about a week. Adam I have a quick question, when making many of the smoothies or fruit/veggie drinks how long will they store in the fridge? My schedule leaves me very little time at home and I’d like to be able to make some of the drinks in larger quantities to be able to drink them over 2 or 3 days. Right now I’m only making fruit smoothies as needed. I’d like to get more benefits from my VM by making larger batches that I can pour and take. Thank you for any tips and comments on this. That’s a great question, but unfortunately I don’t have a great answer. I drink everything right away because I’ve had some combinations start to taste sub-par after even as little as half an hour in the fridge. 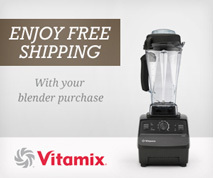 I know of plenty of people who make smoothies and store them though. Part of it will depend on what you put in, and I haven’t found any resources that list the stability of different blended foods. Since I haven’t found any resources I’ve thought about doing my own tests, but I haven’t gotten around to it yet. The one ingredient that I know suffers is oranges, as they get bitter over time. Another thing to try is to add something acidic like lemon juice, which will slow down the enzymatic oxidation of some things (the famous example is the browning of apples, which you can stop with lemon juice). I’d recommend trying out saving some of your smoothie and seeing how it tastes. I suspect you’ll loose a bit of nutritional value due to oxidation, but I bet the smoothie will still be healthier than nothing. This is another case where I haven’t been able to find any good references that document nutritional changes…. Another alternative is to prepare batches of ingredients and save them in the fridge or freezer unblended. They’ll keep better that way, and when it’s time to make a smoothie you won’t have to worry about washing/peeling produce. Love the color! I’ve never seen purple sweet potatoes. I bought some yellow beets today and want to use them in a smoothie. Should I cook them first? Any ideas what to mix with them? I wrote about using beets a while back. Cooking and/or peeling are optional, but will give you a slightly more mild flavor. I like to put them in with carrot-apple-ginger, or V8/gazpacho blends. I want to make a pie out of this! Looks a lot like an actual pie I had in Hawaii, probably minus the blueberries, in a graham-cracker crust. I bet if you put in some eggs it would work. Unfortunately, I have never seen purple sweet potatoes either, but I’m going to look for them! That looks like our Stokes Purple Sweet Potatoes! 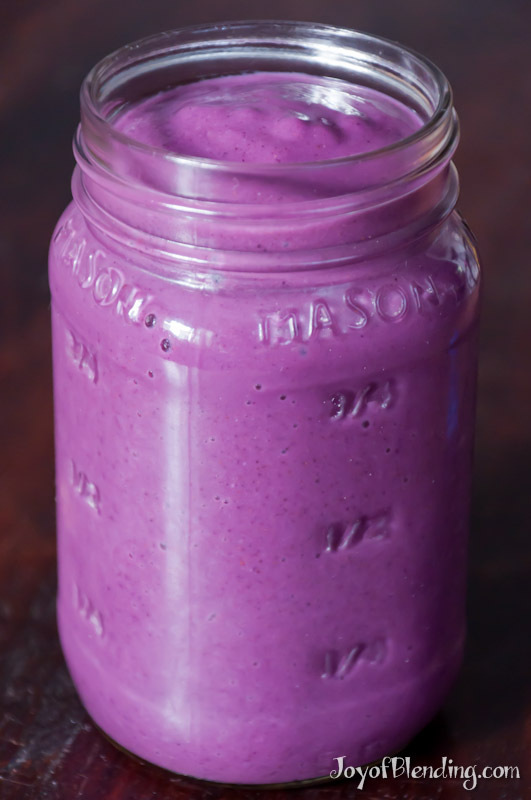 You know, this is the first smoothie recipe we’ve found that uses the Purple Sweet Potatoes. We’d love to share this with our friends! I’m glad you found my recipe; please feel free to share it! Do you have details on which stores stock Stokes purple sweet potatoes? Also, what months are they generally available? You can also email us at mail@friedas.com with your city and stores in your area and we might be able to help you narrow it down. You can purchase them through our Amazon store, however, we usually suggest that you chat up the produce manager in your local grocery stores. They may just be able to order some for you! Adam, I don’t know if there’s more than one type of purple yam (purple sweet potato), but I do know that you are more likely to find those in a Japanese/Korean grocery store than a typical grocery store (as that’s where I bought those and none can be found else where). I do not know the season though. You might want to verify my statement here before you suggest to your readers where to shop. Today I made a trip to a Chinese grocery store and a Korean/Japanese grocery store in town. Both stores are well stocked with the purple sweet potatoes. (Though the Chinese store mis-labeled them as purple yams but I think they are indeed purple sweet potatoes.) I’ve been looking for these in a typical American grocery store and no one (near me) sells it. I found a couple stores that sell purple potatoes but they are not sweet potatoes. If your readers have access to a Chinese, Korean, or Japanese grocery store in town, they are very like to find them and the prices are quite economical. I really enjoyed this recipe, its color is beautiful and it’s quite filling. Thank you for sharing. I made this twice, the second time with some minor changes. I doubled the amount of sweet potato (2, since they are tiny) and blueberry (1/2 C) so that the sweet potato/blueberry flavors are more pronounced compared to the apple. Is there any other fruits that I can substitute blueberries and cranberries for? This recipe is good without the berries as well. Persimmons and apples are my go-to fruits for sweet potato smoothies, but I bet other fruits would be good. Sorry, how many servings does this recipe make? I would call it 2 medium servings, or 1 large serving. I fixed my purple sweet potato smoothie very good, but my purple color was not like that of the picture. could it be the manchine.